UCR nematology professor Holly Bik is pioneering the use of microscopic worms as indicators of pollution and environmental change in marine environments. For this effort, Bik has won California Sea Grant’s 2019 Special Focus Award, one of only four such awards handed out in the entire state. UCR Nematology professor Holly Bik. The award provides her lab with $70,000 to evaluate the health of an estuary near the now-defunct San Onofre nuclear power plant. Bik says the worms offer valuable data about whether the estuary is as healthy as it should be. Bik says no baseline data exists on nematode counts in healthy estuaries because gathering data onthe tiny worms used to be labor-intensive. Modern DNA sequencing tools make it possible now to gather species data in a fraction of the time, and to quickly learn about the effects of emerging contaminants such as flame retardants and microplastics. For this project, Bik and her graduate student Hannah Kissinger will compare the restored estuary near the San Onofre power plant to three unaffected estuary sites. Traditional metrics for environmental health often track the number of invertebrates. But Bik says those indexes may not be as accurate for monitoring estuaries, where invertebrates aren’t able to survive even when no pollution is present. Therefore, nematodes are an especially effective way to monitor the estuaries because many other, larger species of animals aren’t able to tolerate the changing salinities and tidal fluctuations found there – but the worms can. 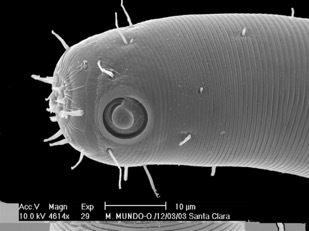 In collaboration with the Southern California Coastal Water Research Project, the work not only will generate information about the health of the restored estuary, but also will develop the first standardized methods for nematode sampling as part of environmental assessments and monitoring. California Sea Grant is a collaboration of the National Oceanic and Atmospheric Administration, or NOAA, the state of California, and universities across the state to create knowledge, products, and services that benefit the economy, the environment and its citizens.